rame lets people create simple, immersive WebVR scenes that you can share with others, embed on your own website, or use as an immersive meeting space. It works on just about any modern device - desktop, mobile, or VR. Frame is just getting started, and this is just an alpha release. Although we have goals for Frame that aren't close to being realized, and we've only laid some of the ground layer of what's to come, we're already seeing early testers do interesting things with the tool. Help us shape Frame with your feedback and thoughts. To enter the alpha of Frame, you can get started at framevr.io. Once inside, explore around to learn more about Frame. You can make an account by clicking the orange button on the top right corner. You don't need an account to view Frames, but you do need one to claim your own Frames, manage some basic permissions, and do other fun things. The team behind Frame also does custom WebVR work, and you can learn more about that here. We think the web is a big deal for VR, and VR is a big deal for the web. 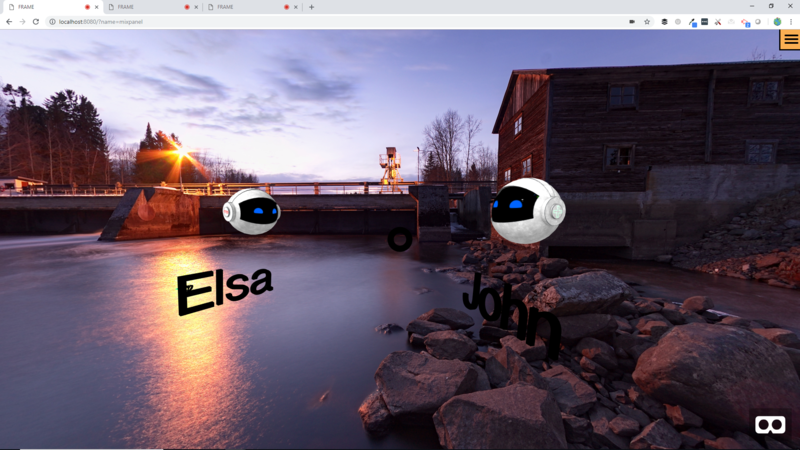 Frame is a super simple site you can use to create WebVR scenes, or "Frames", to share with others, embed on your own site, or use as a meeting space for real-time interaction with others. Frame is built with WebVR, so it runs right from a web browser on desktop, mobile, or standalone VR. See here for info on WebVR compatibility. Frame is still in early alpha, so we can't guarantee 100% up-time or 24/7 support. Frame is free, and there will always be a free plan available. Frame isn't a tool for programmers or a VR development framework like Unity 3D, Unreal, or A-Frame (although Frame is built with A-Frame!). There is no coding in Frame and it's really intended for non-technical users. Frame also isn't a 3D design tool like Blender, Tinkercad, or 3DS Max. You can bring 3D models created from those tools (and many more) into your Frames, though. Frame isn't an application that you need to download. What can you already do with Frame? Currently, you can bring 3D models (.glb format), images, and photospheres into your Frames. Your Frames are persistent, meaning that changes you make to your Frames will stick around, even if you refresh the page. If you want your Frame to be used as a collaboration space or meeting room, you can make it "multi-user" and then anyone who visits your Frame at the same time will be able to interact as avatars. You can toggle whether other people are able to permanently edit your Frame or not. There's a lot more coming soon. Let us know what you'd like to see next. Lots of stuff! Stay tuned! See what's new in Frame 0.2: mic features, a new home environment, a Frame Gallery, and more.